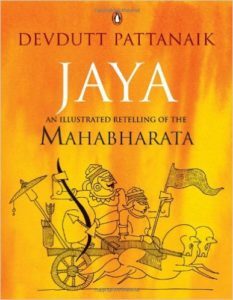 Dr Pattanaik (a medical doctor who became a pharmaceutical executive and then a writer on mythology and an amateur Indologist) has written ”Jaya”, a modern (and highly condensed) “retelling” of the ancient Indian epic, the Mahabharata. The Mahabharata, in its canonical Sanskrit version (which was likely finalized sometimes in the first 500 years CE) consists of 18 parts of varying length, and is by far the longest epic poem in the world (a 100,000 verses, ten times longer than the Iliad and Odyssey combined). The poem itself states that this is an expanded version of an earlier, much shorter epic, so there is no question about the fact that it has multiple authors who have added and subtracted (mostly added) material over hundreds or even thousands of years to what was probably a much more compact original. A complete English translation (complete as far as possible at that time) was carried out by Krishan Mohan Ganguly and published in 1896 and is available online at Sacred Texts. It is, of course, extremely long and is written in somewhat archaic and ornate English (for example the word “puissant” is used every time one of the characters is described as powerful; which, as you can imagine, happens a lot in an epic about powerful people), but it has a certain old-fashioned charm and I can attest that dipping into it to look up a particular episode, or just at random, can be an addictive exercise. Scholars, meanwhile, have continued to refine the canonical text, and new, presumably more authoritative, collections and translations continue to be published. Not being a scholar of either Indic literature or the Mahabharata, I will say no more on that topic, so on to Jaya. Dr Pattanaik has clearly read widely, and bases his book not just on the canonical Sanskrit version but also on multiple local and even international variants (the Indonesian version is referenced and dipped into on multiple occasions). The book gets four stars for summarizing this huge mass of material into one easy to read and coherent volume and for its many interesting references to other Indian literary gems (some relatively well known, such as the plays of Kalidasa; and others, both ancient and modern, with which we (i.e. people of Indic origin) are much less familiar than we ought to be). The end result is a book that tells not just the basic story of the Mahabharata but also give us an inkling of the vast ocean of Indic religious and secular literature that we may then be tempted to read in more detail. 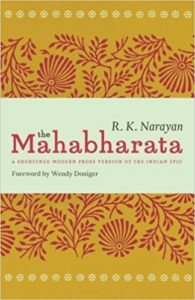 At one level, the Mahabharata is the story of the Kuru clan with their complicated semi-divine genealogy and their descent into vicious internecine warfare; culminating in a grand confrontation at Kurukshetra that ends with the victory of the (mostly) virtuous Pandava brothers over their (mostly) villainous Kaurava cousins. The story is complex and multi-layered, the characters are memorable and many-sided and every episode is open to multiple interpretations. To add to this narrative and moral complexity, there are countless stories within stories, there is statecraft, there is practical advice, there are profound and timeless moral lessons and there is an elegiac and tragic “passing of an age” ambiance that hovers over the entire epic. Somehow the epic also combines a feeling of looking deep into the past with the realization that this is all about us, today, as much as it is about our distant forefathers in Vedic India. Pattanaik does nothing extraordinary with the material, but the material itself is so powerful, it needs very little to work its magic on the reader. I had read the story before, but he managed to keep my interest and to tell me many new things and he kept me hooked to the end. The extensive references to various versions of the main story and to stories that do not exist in the main version but exist in various locales or in the works of various later Indian writers greatly enriches the book. He adds a short “this is what the symbolism/story means” at the end of every episode, and it is frequently presented as if THIS interpretation is the standard Hindu view, not the personal view of the author. 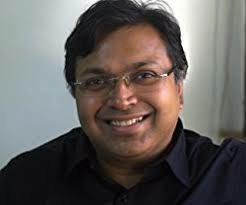 I am no expert, but it is my impression that there is no such thing as a consensus Hindu view of what every episode or metaphor really means; and where there is such a consensus, it may not always be what Dr Pattanaik says. In some cases, he is clearly just promoting a pet theory, which he may regard as a great insight, but which is far from being widely accepted or even known. For example, he makes much of the “Yayati complex vs the Oedipus complex”, which he wants to present as a key difference between Indian culture (where the son sacrifices himself for the father) and “Western culture” (where the son rebels against and kills the father). Other such stereotypical, pedestrian and formulaic theories abound in this book and I personally think we could have done without them. At the very beginning he casually throws in that “Veda” comes from “Vedena”, “the yearning of the collective human soul” , which is simply not true. The commonly understood etymology is that it comes from Ved, “to see” (from which come words like video) and the meaning evolved to mean “to know”, “Knowledge”, “wisdom” and so on. This kind of casual mistake makes one suspect that other casual comments about the origins of particular words may also be incorrect (or at least, may not reflect what most other scholars believe). This kind of “trust issue” undermines the usefulness of the book. At several points he uses a version of the story that is not from the traditional Sanskrit text, but from various local versions. This is fine, since the traditional Sanskrit text itself includes elements that were added by various authors over a long period of time. Still, it does have a certain canonical status and it would be better if the standard/classical story is given first, then he can add in variants and alternative readings. To his credit, these variants are almost always noted to be variants, but usually this fact is mentioned AFTER the episode has been presented as the next step in the story, which can leave the casual reader with a misleading picture of what the epic represents to most Hindus. This is not to disparage the use of these variants; their existence and persistence adds to the story, and tells us something important about the “multiplicity in unity” that is itself a defining feature of Hinduism (e.g. we learn that in one variant, popular in one part of Tamil Nadu, Draupadi leads an army of women into battle; or that there is a valley in India where there are temples to Duryodhana, arch-villain of the Mahabharata), I just think it would have been better to consistently give the canonical story first, and THEN discuss the variants. It is fine that he relates the story as it is, not edited into modern or rational form, but when talking about the war he takes this credulous/uncritical view even into his own comments, suggesting that “we don’t know if the ancients had nuclear weapons or other advanced weapons” and that “the ancients may have had techniques that allowed them to bring a miscarriage to live birth by incubating in special containers charged with ghee”, which is a bit too much. He also adds up the numbers and tells us in all seriousness that X million fighters fought and died at Kurukshetra; this is mentioned, not as “The Mahabharata says..” but as if it the author believes this, or at least, regards it as perfectly plausible. While the overall story remains gripping and interesting, this is more a credit to the original than to Pattnaik’s skill as a writer. Many striking episodes (for example the story of the mongoose at Yudhishtra’s horse sacrifice, the story of the man suspended over a snake pit, etc) are rather bland and pedestrian in Pattanaik’s version (obviously this is a personal preference issue). Contrast this with, say, Peter Brook’s stage version, to see how powerfully selected events and tales from the epic can be presented. In Brook’s version some of these tales are subtly or even completely changed; e.g. Duryodhana’s reaction to Ashwathama’s “massacre of the innocents” is negative in the original, but in Peter Brook’s version he says “good” very emphatically, and it makes for great theater and is more in character. But unfortunately, Pattnaik is not Peter Brooks. As a stylist and story-teller, he rarely improves on the original and frequently falls behind it. Still, all this being said, this is not a bad way to get introduced to the Mahabharata. Truly, as the poem says about itself: all that is out there is in here; what is not here is nowhere..
PS: I greatly enjoyed RK Narayan’s version, which was my introduction to this amazing epic and remains a favorite. As a story, it is better written than Jaya, though Jaya has more information packed into it. Director Shyam Benegal made a pretty good movie (Kalyug, 1981) based distantly on the Mahabharata, but set in License-Raj Mumbai. The movie is worth watching just as a well-made Bollywood “art movie”, but becomes more fun if you are familiar with the Mahabharata and catch some of the references. 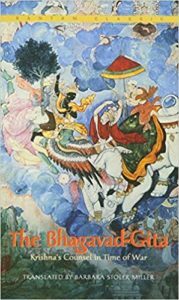 And finally, a plug for my favorite English version of the Bhagwad Gita: Barbara Stoler Miller’s “The Bhagavad-Gita: Krishna’s Counsel in Time of War”. The high race of the Bharatas is its topic. Hence it is called Bharata. And because of its grave import, as also of the Bharatas being its topic, it is called Mahabharata. He who is versed in interpretations of this great treatise, becomes cleansed of every sin. Such a man lives in righteousness, wealth, and pleasure, and attains to Emancipation also, O chief of Bharata’s race. ..That which occurs here occurs elsewhere. That which does not occur here occurs nowhere else. This history is known by the name of Jaya. It should be heard by every one desirous of Emancipation. It should be read by Brahmanas, by kings, and by women quick with children. He that desires Heaven attains to Heaven; and he that desires victory attains to victory. The woman quick with child gets either a son or a daughter highly blessed. ..Thousands of mothers and fathers, and hundreds of sons and wives arise in the world and depart from it. Others will (arise and) similarly depart. There are thousands of occasions for joy and hundreds of occasions for fear. These affect only him that is ignorant but never him that is wise. With uplifted arms I am crying aloud but nobody hears me. From Righteousness is Wealth as also Pleasure. Why should not Righteousness, therefore, be courted? For the sake neither of pleasure, nor of fear, nor of cupidity should any one cast off Righteousness. Indeed, for the sake of even life one should not cast off Righteousness. Righteousness is eternal. Pleasure and Pain are not eternal. Jiva is eternal. The cause, however, of Jiva’s being invested with a body is not so.. Apologies if this seems overly fastidious: the word is “Kaurava”. Sanskrit derivative vRddhi of “kuru”, implies descendant of or hailing from. E.g. pandu > pandava, sindhu > saindhava, raghu > raghava etc. Great review by the way. Enjoyed it. Though I usually don’t trust Pattanaik’s views, as I think he’s prone to fustian language use with typically trite content. Really puts me off. What is your opinion of Bibek Debroy’s 10 volume, unabridged English translation of Mahabharat? Did you get a chance to read it?